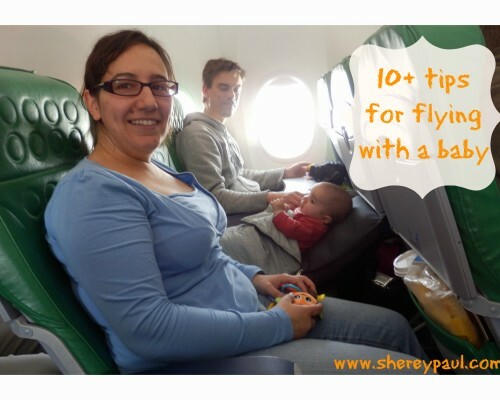 Some months ago I wrote tips for flying with a baby. 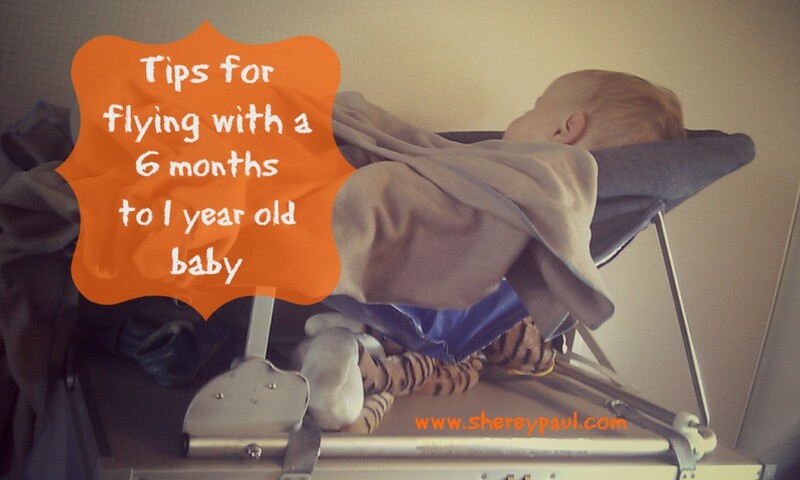 This post is the continuation and focused on tips for flying with a 6 to 12 months old baby. What is the different between a baby younger than 6 month and one between 6 and 12 months old? 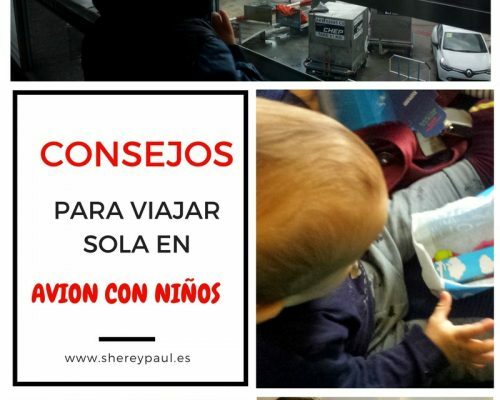 Firstly, at 6 months babies start eating solids, so you will need to bring some food or snacks in your hand luggage, like bananas or rice cakes. 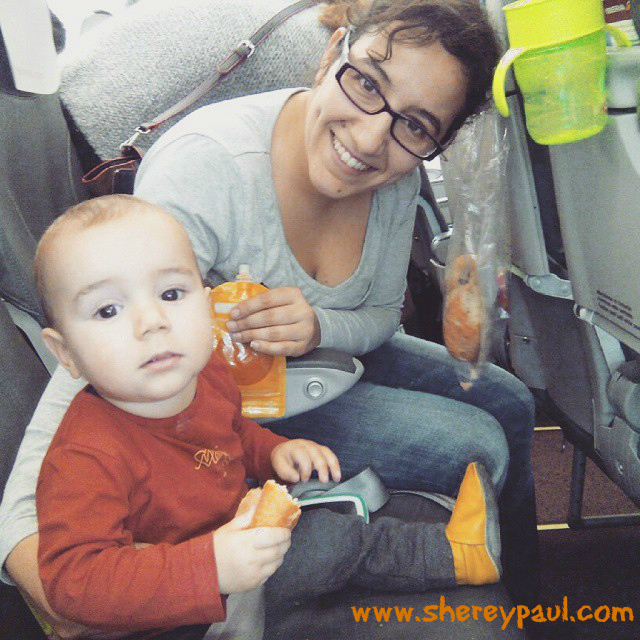 For longer flights you can take “on the go pouches”. If your baby is like ours, he will be able to eat from the pouch itself and by himself. If you are very conscious about the food of your baby, you can even use refillable pouches. If you are going to take a long-haul flight, check the airline offers a baby bassinet. It seems like obvious, but most of the airlines will offer a bassinet for babies up to 6 months. Therefore I have created this comparison of baby bassinets in different airlines. 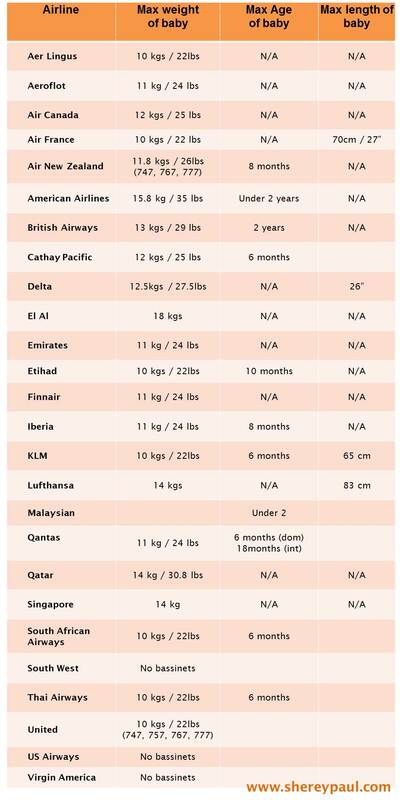 As you see, airlines like american airlines, british airways, el al or quatar offer a bassinet for almost a two year old baby, as their restriction is only on weight (our son weights 10kg at 15 months, so I don’t expect he will gain 5 kg in 7 months). Of course bassinets are perfect for a night flight, but not for a day flight. When we flew to California with British Airways, they offered us a kind of bounced chair for Liam, who was at that time 10 months old. It was perfect!! He was sitting there while we were having lunch/dinner. He also was able to sleep in the chair, he woke up twice as he couldn’t turn. In any case while in the airplane, follow your baby’s sleep routine. Also use a blanket to cover him, if you don’t have his sleeping bag with you. Book the bassinet in advance. The places where a bassinet can be fixed are limited. The advantage of these places is that they have more legs space, so your baby can sit down on the ground in front of you. Bring toys to play with. 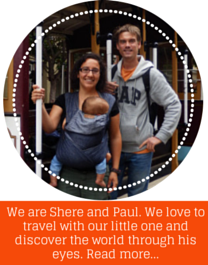 We take a bag filled with different things: a car, a small book, some duplo and wood cubes. He can play with the things inside the bag, but also with the bag. He loves to empty it and then put everything inside again. 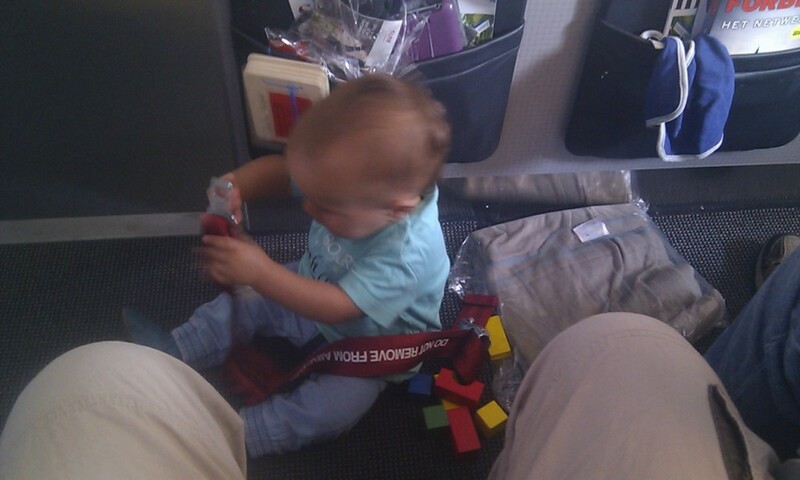 What is your tip for flying with a 6 to 12 months old baby? That bouncy chair is really cool, and it looks like it straps on too. Great tips, but I am glad I am past that. We have moved on to our kids being able to entertain themselves. Very useful information thank you, my kids are pretty big now, 6 and 9, but who know when a new baby can come and these tips become instantly very welcome. Great tips! Also, take a sling with you. When your baby doesn’t want to sleep or starts crying for another reason, you can walk him in the sling through the plane.